The nice folks at Solstice Publishing sent me a preview copy of my cover art! I must say I’m excited about it – and relieved. I had heard so many horror stories about people whose covers sucked and actually damaged their sales. I think this captures the atmosphere of the story rather well, thanks to the artist at Solstice who actually listened to my input on the matter. I started sneaking into the basement to read my parents' massive collection of science fiction, fantasy, and gothic romance when I was nine years old, and I spent my teenage years writing reams of Awesome Novels. This might have worked out better for me if I had not written them during math class. This entry was posted in Seven Turns. Bookmark the permalink. 3 Responses to Cover Art! You know what? 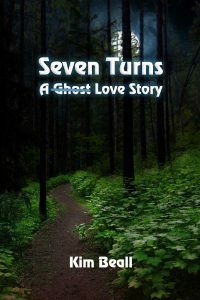 I guess this means “Seven Turns” is no longer just a working title. Apparently we are going with that as the actual title.